Introduction: Prostate cancer remains a challenge as a target for immunological approaches. The approval of the first cell-based immune therapy, Sipuleucel-T for prostate cancer introduced prostate cancer as a solid tumor with the potential to be influenced by the immune system. Methods: We reviewed articles on immunological management of prostate cancer and challenges that lie ahead for such strategies. Results: Treatments have focused on the identification of novel cell surface antigens thought to be unique to prostate cancer. These include vaccines against carbohydrate and blood group antigens, xenogeneic and naked DNA vaccines, and pox viruses used as prime-boost or checkpoint inhibitors. No single vaccine construct to date has resulted in a dramatic antitumor effect. The checkpoint inhibitor, anti-CTLA-4 has resulted in several long-term remissions, but phase III trials have not demonstrated an antitumor effect or survival benefit. Conclusions: Multiple clinical trials suggest that prostate cancer may not be optimally treated by single agent immune therapies and that combination with biologic agents, chemotherapies, or radiation may offer some enhancement of benefit. 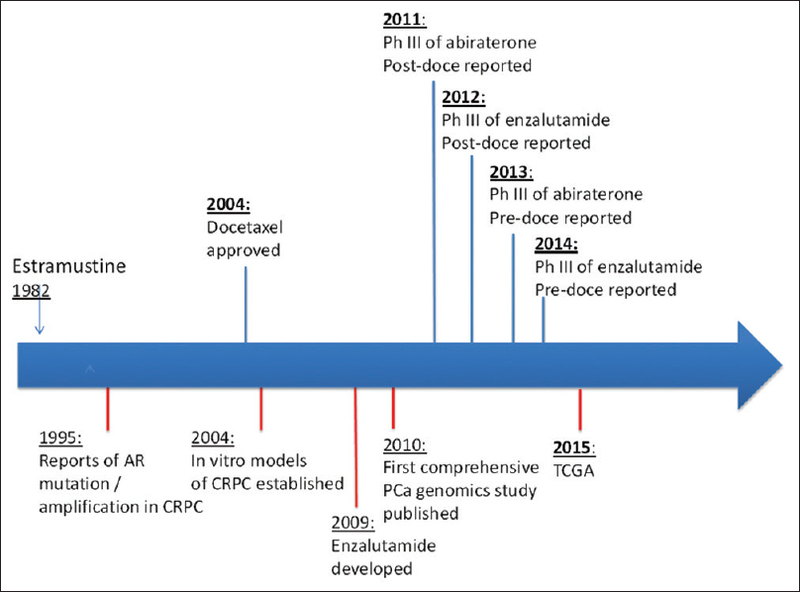 The approval of five new treatments for metastatic castrate-resistant prostate cancer (mCRPC) within the last 5 years has been an unprecedented milestone in prostate cancer treatment ,,,, [Figure 1]. Not only have these drugs successfully changed the therapeutic landscape for this disease but at the same time have also introduced new clinical challenges. These challenges include the identification and integration of novel blood-based biomarkers, sequencing or combination of the androgen-receptor (AR) targeting drugs, , use of early chemotherapy intervention, and more recently, the role of genomic profiling  in disease prognosis and treatment. While clinical trials remain the backbone of any drug under development, their role is pivotal towards bringing novel approaches earlier into the clinical arena. The introduction of the first autologous immune-based cellular therapy, Sipuleucel-T  has led to a change in the metastatic treatment paradigm; despite a survival benefit, the lack of a robust antitumor effect has made this agent less appealing. How it ultimately fits into the continuum of prostate cancer treatments remains unclear. Overall, there are many challenges that immune therapies bring to the treatment tableau, and it remains unclear whether prostate is in fact an ideal target for such approaches. The United Kingdom-led STAMPEDE trial  confirmed the observations of Sweeney et al. and found that adding docetaxel chemotherapy to standard hormone therapy markedly improved survival for men with newly diagnosed advanced prostate cancer not previously treated with hormone therapy (hormone-naive). Men who received docetaxel plus standard hormonal therapy lived on average 10 months longer than those who received only standard therapy. STAMPEDE used a novel trial design that was a multiarm, multistage platform to test whether the addition of treatments at the time of long-term hormone therapy initiation improved overall survival. This is the first time that a clinical trial had multiple arms with different agents in which patients could be studied prospectively. The trial included interim activity analyses based on failure-free survival to select groups to continue accrual for fully powered survival analysis. The patient population included men with metastatic (M1), high-risk localized (N0), or node-positive (N+) prostate cancer who were newly diagnosed or had high-risk recurrent disease following prior localized therapy. These were stratified to receive standard of care, i.e., hormonal therapy (n = 1184) or standard of care plus docetaxel at the dose of 75 mg/m 2 (n = 592). The median overall survival was 71 months (interquartile range 32 to not reached) for the hormonal arm-only, 81 months (41 to not reached) for hormones and docetaxel (0·78, 0·66-0·93; P = 0·006). These studies endorse the potential benefits of using docetaxel in conjunction with standard hormonal therapy; physician choice based on clinical assessment is still paramount to initiating treatment. The standards of care continue to be initiating first and second line antiandrogens i.e., the addition of antiandrogens or AR-directed therapies in the setting of patients who have been on single agent agonist or antagonists or have been on prior antiandrogens. For the latter, a trial of antiandrogen withdrawal is reasonable. It should be noted that following a standard treatment algorithm for all patients may not be reasonable as these patients may have a more aggressive biology and need other means of evaluating the potential of the behavior, i.e., gene profiling of tumor or assessing circulating tumor cells. When to initiate docetaxel in this setting remains the physician's choice. The rationale for using docetaxel first line after standard hormonal therapies in lieu of its immediate use posthormonal therapy may be based on several factors. Patients whose prostate-specific antigen (PSA) is rapidly rising and unresponsive to first-line hormonal therapy are more symptomatic, i.e., failure to thrive, poor oral intake, decreased performance status, or having multiple sites of pain whereby significant radiation would be needed are appropriate candidates to start docetaxel. Not only was a survival benefit observed , but it also improved the quality of life. Determining the biology through the disease's natural history is important in determining how to proceed with any given therapy. The approval of enzalutamide  (Xtandi™) and abiraterone  (Zytiga™) given before or after docetaxel has changed the natural treatment landscape of prostate cancer. However, patients continue to develop resistance to these drugs through a variety of means. As such, new strategies are needed to circumvent resistance and still maintain treatment efficacy. Patients are aware of the successes of these agents in providing a survival benefit and the rapid onset of antitumor responses. Nevertheless, many patients prefer to avoid the use of "toxins" which they often think are synonymous with chemotherapy and want a more "natural" approach, i.e., using their own immune system to fight the cancer. Many approaches have been used to date including synthetic mimes of known carbohydrate molecules over expressed on prostate cancer cells and cells lines, , DNA vaccines,  prime-boost virus vector vaccines, , irradiated prostate cancer cell lines transduced with the genes for growth factors,  as well as combination approaches with chemotherapy. We have learned a considerable amount about vaccine trials in prostate cancer [Table 1] but still are behind the accomplishments seen in other solid tumors such as melanoma, bladder, renal cell, and nonsmall cell lung cancers. Many urologists have advised its use in the setting of biochemically relapsed prostate cancer with the consideration that this therapy may be changing the immune milieu early on in the disease thereby making other subsequent therapies more effective. There have been no strong data to support it effects however. Attempts to enhance this approach have been made by others including a combination of Sipuleucel-T with biologic agents. ,,,, These efforts continue in an attempt to optimize the use of Sipuleucel-T within the prostate cancer treatment continuum. Despite the enthusiasm for using immune therapies in prostate cancer, there remains a paucity of agents for testing. PROSTVAC, a DNA vaccine comprised a recombinant vaccinia vector as the primary immunotherapy backbone. It is followed by booster immunization using a recombinant fowl pox vector. The vectors contain transgenes for PSA and TRICOM, the latter being 3 co-stimulatory molecules intracellular adhesion molecule-1 (CD54), B7.1 (CD80), and leukocyte function-associated antigen-1 (CD58). Unlike Sipuleucel-T, this construct was based on the inherent immunogenicity of the pox virus. An anti-PSA directed T-cell response is generated but at the same time, other antigens may be exposed that could activate other T cells. This is in part thought to be how Sipuleucel-T works through "antigen spreading". Results of phase I and phase II trials have been encouraging with the phase II trial suggesting a survival benefit comparable to that of Sipuleucel-T. However, the results of the completed phase III trial, are eagerly awaited. Checkpoint inhibitors: why not prostate cancer? The excitement over immunotherapy in solid tumors has occurred as a result of the significant and durable responses obtained in several malignancies using checkpoint inhibitors. The first, a monoclonal antibody directed against the checkpoint molecule, CTLA-4  (Ipilimumab, Yervoy™) was approved for melanoma in the setting of improved survival and antitumor effects. CTLA-4 is a protein receptor that resides within the T cells and downregulates the immune system [Figure 2]. Upon T-cell engagement with dendritic or antigen presenting cells (APCs), the cells that present cancer or foreign antigens to the T cell, the T cell must have certain costimulatory molecules that tell it to either proliferate or abort its interaction with the APC. Activation of resting or quiescent T-cell requires two complementary signals. Engagement of the T-cell receptor must be accompanied by a second signal that results from the binding of receptors on the T cell with either soluble factors, such as IL-2, or cell-surface molecules on the antigen-presenting cell. CD28 and CTLA-4 are receptors on T cells that play critical roles in the initial activation and subsequent control of cellular immunity. CD28 is expressed constitutively on T cells; it provides a co-stimulatory signal upon binding to target ligands on antigen-presenting cells. Conversely, CTLA-4 is transiently expressed following T-cell activation. The signal delivered through CTLA-4 down regulates T-cell function and inhibits excessive expansion of activated T cells. How do we strategize the implementation of immune therapies when the dramatic impact seen in other solid tumor far outshines that which is seen in prostate cancer? Among the theories for suboptimal responses in prostate cancer is the concern that prostate cancer is not a hypermutated disease as seen in other diseases  [Figure 3]. Other approaches now are focusing on "armored" or chimeric antigen receptor directed T cells, whereby the patient's own T cells can be redirected to recognize and kill tumor cells that express a particular antigen on its surface. It has had significant successes in hematologic malignancies such as acute lymphocytic leukemia but has been limited in prostate cancer. ,,, The reasons are many such as presence of sclerotic, bone disease may prevent these cells from trafficking to sites of active tumor, many more cells may been needed given that the reticuloendothelial system may engulf these cells and prevent them from reaching their target, and the durability of the cells may not be as long as may be needed to effect antitumor effects, i.e., hours to days or weeks. While immune therapies can be used to treat at any time during the disease progression, there is still a need for immune agents that can be used either alone or in concert with other therapies. Prostate as a solid tumor remains a challenge in that we are lacking the robust antitumor responses seen with other agents despite survival benefits. It is eagerly anticipated that as we gain more experience with these agents, we will be able to maximally enhance treatment responses and their durability. de Bono JS, Oudard S, Ozguroglu M, Hansen S, Machiels JP, Kocak I, et al. Prednisone plus cabazitaxel or mitoxantrone for metastatic castration-resistant prostate cancer progressing after docetaxel treatment: A randomised open-label trial. Lancet 2010;376:1147-54. Kantoff PW, Higano CS, Shore ND, Berger ER, Small EJ, Penson DF, et al. Sipuleucel-T immunotherapy for castration-resistant prostate cancer. N Engl J Med 2010;363:411-22.
de Bono JS, Logothetis CJ, Molina A, Fizazi K, North S, Chu L, et al. Abiraterone and increased survival in metastatic prostate cancer. N Engl J Med 2011;364:1995-2005. Scher HI, Fizazi K, Saad F, Taplin ME, Sternberg CN, Miller K, et al. Increased survival with enzalutamide in prostate cancer after chemotherapy. N Engl J Med 2012;367:1187-97. Parker C, Nilsson S, Heinrich D, Helle SI, O′Sullivan JM, Fosså SD, et al. Alpha emitter radium-223 and survival in metastatic prostate cancer. N Engl J Med 2013;369:213-23. Taylor BS, Schultz N, Hieronymus H, Gopalan A, Xiao Y, Carver BS, et al. Integrative genomic profiling of human prostate cancer. Cancer Cell 2010;18:11-22. Scher HI, Kelly WK. Flutamide withdrawal syndrome: Its impact on clinical trials in hormone-refractory prostate cancer. J Clin Oncol 1993;11:1566-72. James ND, Sydes MR, Clarke NW, Mason MD, Dearnaley DP, Spears MR, et al. Addition of docetaxel, zoledronic acid, or both to first-line long-term hormone therapy in prostate cancer (STAMPEDE): Survival results from an adaptive, multiarm, multistage, platform randomised controlled trial. Lancet 2016;387:1163-77. Petrylak DP, Tangen CM, Hussain MH, Lara PN Jr., Jones JA, Taplin ME, et al. Docetaxel and estramustine compared with mitoxantrone and prednisone for advanced refractory prostate cancer. N Engl J Med 2004;351:1513-20. Slovin SF, Ragupathi G, Musselli C, Olkiewicz K, Verbel D, Kuduk SD, et al. Fully synthetic carbohydrate-based vaccines in biochemically relapsed prostate cancer: Clinical trial results with alpha-N-acetylgalactosamine-O-serine/threonine conjugate vaccine. J Clin Oncol 2003;21:4292-8. Slovin SF, Ragupathi G, Fernandez C, Jefferson MP, Diani M, Wilton AS, et al. A bivalent conjugate vaccine in the treatment of biochemically relapsed prostate cancer: A study of glycosylated MUC-2-KLH and Globo H-KLH conjugate vaccines given with the new semi-synthetic saponin immunological adjuvant GPI-0100 OR QS-21. Vaccine 2005;23:3114-22. McNeel DG, Dunphy EJ, Davies JG, Frye TP, Johnson LE, Staab MJ, et al. Safety and immunological efficacy of a DNA vaccine encoding prostatic acid phosphatase in patients with stage D0 prostate cancer. J Clin Oncol 2009;27:4047-54. Kantoff PW, Schuetz TJ, Blumenstein BA, Glode LM, Bilhartz DL, Wyand M, et al. Overall survival analysis of a phase II randomized controlled trial of a Poxviral-based PSA-targeted immunotherapy in metastatic castration-resistant prostate cancer. J Clin Oncol 2010;28:1099-105. Slovin SF, Kehoe M, Durso R, Fernandez C, Olson W, Gao JP, et al. A phase I dose escalation trial of vaccine replicon particles (VRP) expressing prostate-specific membrane antigen (PSMA) in subjects with prostate cancer. Vaccine 2013;31:943-9. Small EJ, Sacks N, Nemunaitis J, Urba WJ, Dula E, Centeno AS, et al. Granulocyte macrophage colony-stimulating factor - Secreting allogeneic cellular immunotherapy for hormone-refractory prostate cancer. Clin Cancer Res 2007;13:3883-91. Petrylak DP, Dawson NA, Gardner T, Klotz L, Curti BD, Flanigan RC, et al. Persistence of immunotherapy survival effects of sipuleucel-T and relationship to postrandomization docetaxel use in phase III studies. J Clin Oncol 2010;28 Suppl 15. [Abstr. No. 4551]. Flammiger A, Bayer F, Cirugeda-Kühnert A, Huland H, Tennstedt P, Simon R, et al. Intratumoral T but not B lymphocytes are related to clinical outcome in prostate cancer. APMIS 2012;120:901-8. Strasner A, Karin M. Immune infiltration and prostate cancer. Front Oncol 2015;5:128. Sheikh NA, Petrylak D, Kantoff PW, Dela Rosa C, Stewart FP, Kuan LY, et al. Sipuleucel-T immune parameters correlate with survival: An analysis of the randomized phase 3 clinical trials in men with castration-resistant prostate cancer. Cancer Immunol Immunother 2013;62:137-47. Sheikh N, Perdue N, Trager J, Haynes H, Guhathakurta D, Kandadi H. Integrated analysis of immunological profiles during manufacture of sipuleucel-T. FOCIS 2013. [Abstract No. S78]. Mulders PF, De Santis M, Powles T, Fizazi K. Targeted treatment of metastatic castration-resistant prostate cancer with sipuleucel-T immunotherapy. Cancer Immunol Immunother 2015;64:655-63. Fong L, Weinberg V, Chan S, Corman J, Amling C, Stephenson RA, et al. Neoadjuvant Sipuleucel-T in Localised Prostate Cancer: Effects on Immune Cells within the Prostate Tumour Microenvironment. European Society for Medical Oncology (ESMO) Congress, Vienna, Austria, 28 September, 02 October, 2012. [Poster No. 939]. McNeel DG, Gardner TA, Higano CS, Kantoff PW, Small EJ, Wener MH, et al. A transient increase in eosinophils is associated with prolonged survival in men with metastatic castration-resistant prostate cancer who receive sipuleucel-T. Cancer Immunol Res 2014;2:988-99. Small EJ, Lance R, Gardner TA, Karsh LI, Stubbs A, McCoy C, et al. A randomized phase II, open-label study of sipuleucel-T with concurrent or sequential abiraterone acetate (AA) in metastatic castrate-resistant prostate cancer (mCRPC). J Clin Oncol 2013;31 Suppl 6. [Abstr. No. 114]. Antonarakis ES, Kibel AS, Adams G, Karsh LI, Elfiky A, Shore ND, et al. A randomized phase II study evaluating the optimal sequencing of sipuleucel-T and androgen deprivation therapy (ADT) in biochemically recurrent prostate cancer (BRPC): Immune results. Genitourinary Cancers Symposium (February 14-16, 2013). J Clin Oncol 2013;31 (February 20 Suppl. [Abstr. 5016] 34. Hodi FS, O′Day SJ, McDermott DF, Weber RW, Sosman JA, Haanen JB, et al. Improved survival with ipilimumab in patients with metastatic melanoma. N Engl J Med 2010;363:711-23. Slovin SF, Higano CS, Hamid O, Tejwani S, Harzstark A, Alumkal JJ, et al. Ipilimumab alone or in combination with radiotherapy in metastatic castration-resistant prostate cancer: Results from an open-label, multicenter phase I/II study. Ann Oncol 2013;24:1813-21. Kwon ED, Drake CG, Scher HI, Fizazi K, Bossi A, van den Eertwegh AJ, et al. Ipilimumab versus placebo after radiotherapy in patients with metastatic castration-resistant prostate cancer that had progressed after docetaxel chemotherapy (CA184-043): A multicentre, randomised, double-blind, phase 3 trial. Lancet Oncol 2014;15:700-12.
van den Eertwegh AJ, Versluis J, van den Berg HP, Santegoets SJ, van Moorselaar RJ, van der Sluis TM, et al. Combined immunotherapy with granulocyte-macrophage colony-stimulating factor-transduced allogeneic prostate cancer cells and ipilimumab in patients with metastatic castration-resistant prostate cancer: A phase 1 dose-escalation trial. Lancet Oncol 2012;13:509-17. Madan RA, Heery CR, Gulley JL. Combination of vaccine and immune checkpoint inhibitor is safe with encouraging clinical activity. Oncoimmunology 2012;1:1167-8. Lawrence MS, Stojanov P, Polak P, Kryukov GV, Cibulskis K, Sivachenko A, et al. 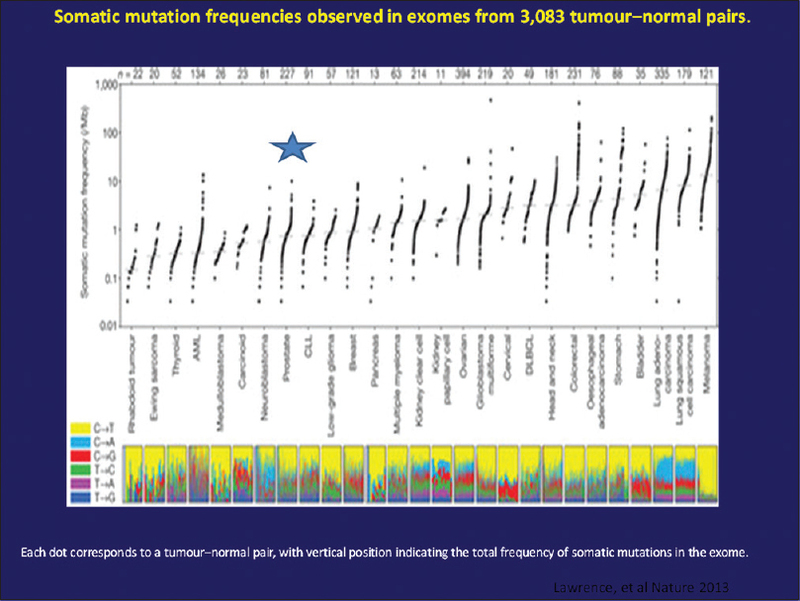 Mutational heterogeneity in cancer and the search for new cancer-associated genes. Nature 2013;499:214-8. Gade TP, Hassen W, Santos E, Gunset G, Saudemont A, Gong MC, et al. Targeted elimination of prostate cancer by genetically directed human T lymphocytes. Cancer Res 2005;65:9080-8. Koehne G, Doubrovin M, Doubrovina E, Zanzonico P, Gallardo HF, Ivanova A, et al. Serial in vivo imaging of the targeted migration of human HSV-TK-transduced antigen-specific lymphocytes. Nat Biotechnol 2003;21:405-13. Junghans RP. Phase IB trial redesign to test role of IL2 with anti-psma designer T cells to yield responses in advanced prostate cancer. J Clin Oncol 2012;30:5. Slovin SF, Wang X, Hullings M, Arauz G, Bartido S, Lewis JS, et al. Chimeric antigen receptor (CAR+) modified T cells targeting prostate-specific membrane antigen (PSMA) in patients (pts) with castrate metastatic prostate cancer (CMPC). J Clin Oncol 2013;31 6 Suppl. [Abstr. 72].